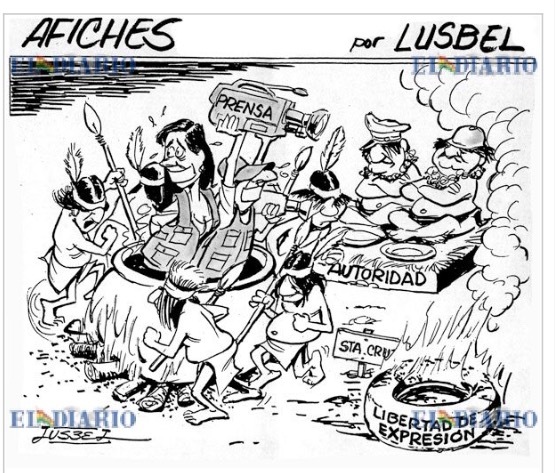 Freedom of Expression is under peril in Bolivia! Today’s cartoon in El Diario reflects Bolivian democracy is in danger! The press is being hunted fierce and relentlessly by the masistas. Freedom of expression is under peril. Owners and journalists of media who remain “independent”, that is: not under the control of the government, who have not been bought or “purchased” with propaganda money from this ochlocracy, are relentlessly being hunted. There are journalists like Carlos Valverde that was “forced” to leave the country, had lost revenue to keep his news program running. This “government” is doing everything to remain in power and that is just sickening!! This entry was posted in Bolivia, Business, Politics, Social Unrest and tagged bad politics, corruption in public office, demagogue, democracy in peril, freedom of expression, freedom of the press. Bookmark the permalink.